...or so I've heard. I don't know. I wasn't there. If this is indeed true, I believe I picked the first-room-to-winnow equivalent of building the Colosseum. Good.grief. 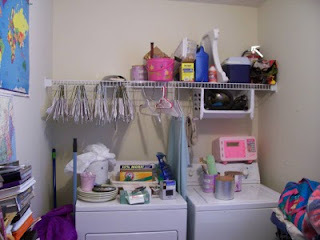 I love my laundry room. It is really a room. There's a lovely window to the backyard. It is quite spacious to work in. That is, it would be without all of the stuff in the way. 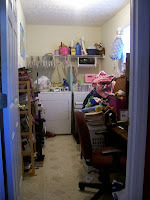 We use this room for laundry, storage, central location for movies (DVDs and VHS), paperwork (files, The Brilliant Beauty's school work, etc. 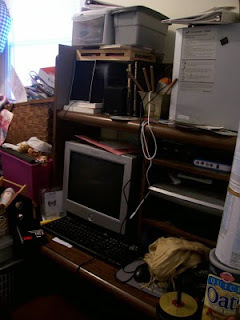 ), and the computer and all it's associated paraphernalia (cables, DVDs, CDs, software, blah, blah, blah, blah, blah). By their powers combined these stuffs make this room the bane of my existence. 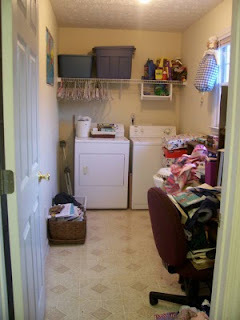 In a move I find akin to walking in front of all of you naked, here is a picture of my laundry room. I can honestly say I don't even know what all is in there. Ugh. 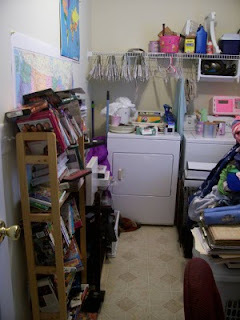 Its full of the afore mentioned items, but also laundry (that stays backed up because a - we all have more clothes than we know what to do with, and b - I ain't ever been consistent in the washing and folding process...I AIN'T. Ever! ), home decor that isn't decorating anything but piles of stuff, exactly one gazillion burnable DVDs from video projects I have made through the years but not labeled or stored, Docile Doggy's kennel,...and the list goes on and on. To the left are the videos, which Little Big Man repeatedly messes with partly out of curiosity and partly because there a mess already, so why not? I'm not even finished, not nearly, but can't you already breathe better? Movies have been sifted through, unwanted ones bagged for Tha Gootwill, and keepers relocated to organized all-ready-owned-but-not-being-used shelving under the window. I've got lots more to do in here, but I see progress. Slow and steady will win the race. Slow mainly because winnowing can't be my full-time gig. Little coos and cries from Pretty Baby, the need for "sumpin' to eat" from Little Big Man, and big-girl-talk-time with Brilliant Beauty remind of that. There the us-es more important than the stuffses (Theo Geisel would be so proud), even the clearing out of the stuffses. 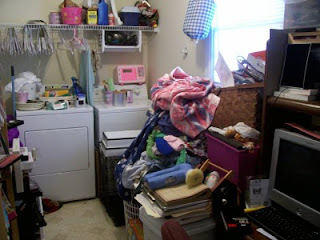 But I aim to be steady, chipping away, every day, at some of that ol' clutter. The harvest is too promising to get choked on the chaff. You amaze me, Jessi. You may just inspire me to tackle some of our stuffses. 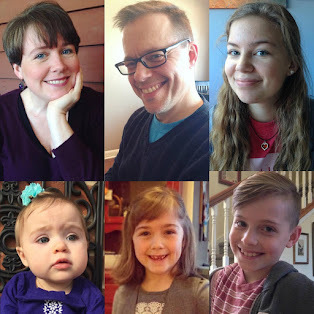 I love love love reading this blog. I too am inspired.